I am always looking for better grooming items and this is one of them! I'll admit, I was skeptical at first, but these work incredibly well. 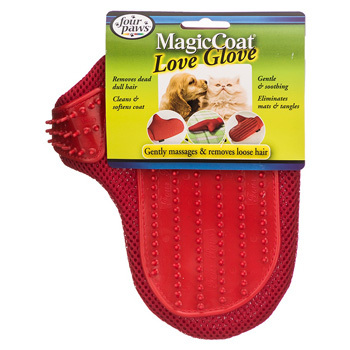 Soft flexible rubber tips gently lift dirt, dust, and dead hair from your pet's coat. Works well on short or long hair. Also lifts hair from furniture, fabrics, and carpets! One size fits all. Glove can be hand washed in warm water and air dried. Just put the glove on your hand and gently stroke your pet's coat. Brush coat as needed and loose hair will cling to the love glove. It works great on our bunnies, even the angora-lionhead with the really long crazy hair! Your bunny gets a wonderful massage and you get a bunny that isn't then shedding all over the place. We are so sorry, but this very popular item is temporarily out of stock. We have reordered many of them, and they should be in shortly. Please check back with us soon to order this item!